Is that really Salman Khan? Yes that's him on the new poster of his upcoming film Bharat. Is that really Salman Khan? Yes that's him on the new poster of his upcoming film Bharat. Not only Salman Khan but also director Ali Abbas Zafar and actress Katrina Kaif shared the actor's new poster of Bharat on Monday and it will instantly max up your curiosity level. 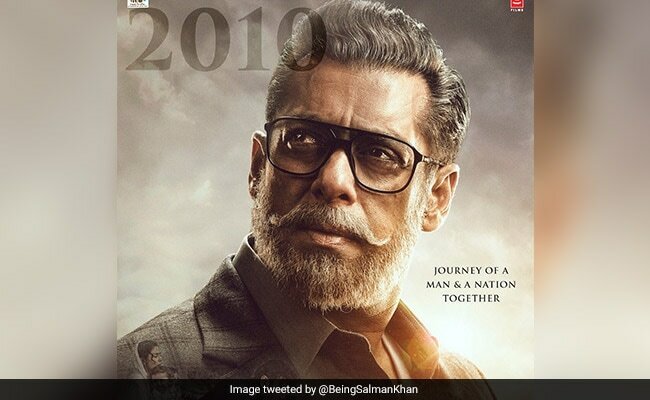 On the poster, Salman Khan sports an aged look with grey stroked hair, beard and moustache. The square framed glasses add degrees of intensity to the look - the wrinkles on his forehead are symbolic of the his life experiences, which has also been explained in Katrina Kaif's caption: "Jitne safed baal mere sar aur dhaadi mein hain,usse kahin zyada rangeen meri zindagi rahi hain!" While Bharat is set across a timeline ranging from the 1960s to present times, Salman Khan's poster is particularly set in 2010. The poster also appears to reveal the protagonist's heart-wrenching encounter of the Partition as we get a glimpse of Jackie Shroff, who plays Salman's father in the movie. Salman Khan's new poster is in stark contrast to how we have seen him for the most part in the teaser, in which he featured as a daredevil stunt artiste of a popular circus group from Sixties' India. While actress Disha Patani plays a trapeze artiste while Tabu, Nora Fatehi and Sunil Grover are also part of the cast. The teaser of Bharat revealed some details about the protagonist - such as how he was named after his country by his father and that for him, there's no room for discrimination based on cast, creed and religion. While much about Katrina Kaif's character is not known, we have seen glimpses of her romancing Salman Khan on screen. Directed by Ali Abbas Zafar, Bharat is slated to hit screens on June 5.